Whenever you see an extensive amount of commercial advertisements on your browser, you should check whether you have RoyalShopperApp installed or not. It is an adware application that generates commercial pop-ups and banner ads each time you browse online shopping websites. Computer security experts recommend removing RoyalShopperApp from the system at once because in the long run this adware application could lead to serious computer security issue. Your computer security should be your utmost priority, so you should avoid any potentially unwanted programs at all cost. It is not the first time we see something like RoyalShopperApp. It is one of the many applications from the so-called semi-random name adware family. According to software.informer.com, some of the RoyalShopperApp name variations include RoyyAlShopperAPp, RaoyAlShopperApp, RoyealShopperApp and RoyaeLShopperApap. However, no matter what entry name you see in Control Panel, the fact remains that you are infected with RoyalShopperApp adware application. Some users think that RoyalShopperApp is a computer virus because the application is not explicit about its presence, but this program is no different from SalesChecker, ShopNDrop, TopBuyer and other semi-random name adware apps. Most of the time, users do not know that RoyalShopperApp enters their computers because the application usually comes bundled with other unwanted programs. It does have a homepage at royalshopperapp.info, but the direct download link is not available there, and overall the website is nothing but a weak attempt at making an impression that RoyalShopperApp is a reliable application. The main distribution network for RoyalShopperApp involves third-party installers like InstallRex, Amonetize and Vittalia. Installer files with RoyalShopperApp and other unwanted applications usually hide behind fake download links on torrent websites or file sharing pages. It simply shows that you have to download programs only from official websites otherwise you would be subject to adware infection. The official website for RoyalShopperApp says that if you use this browser extension “you will feel like you are always on the front row when there are announcements of discounts and store promotions.” In other words, RoyalShopperApp is supposed to help you purchase various goods at the lowest price. However, in order to let you know of these promotions the application displays extensive amount of commercial pop-ups. These pop-ups may be very annoying and even dangerous. It happens when RoyalShopperApp gets used by malevolent third parties for their content promotion. It is not a good idea to trust adware apps because they could be exploited by cybercriminals anytime. Hence, you should uninstall RoyalShopperApp if you want to keep your system and your information safe. Select Uninstall a program and remove RoyalShopperApp. Access Uninstall a program and remove RoyalShopperApp. Open Add or remove programs and uninstall RoyalShopperApp. Remove RoyalShopperApp from the list. 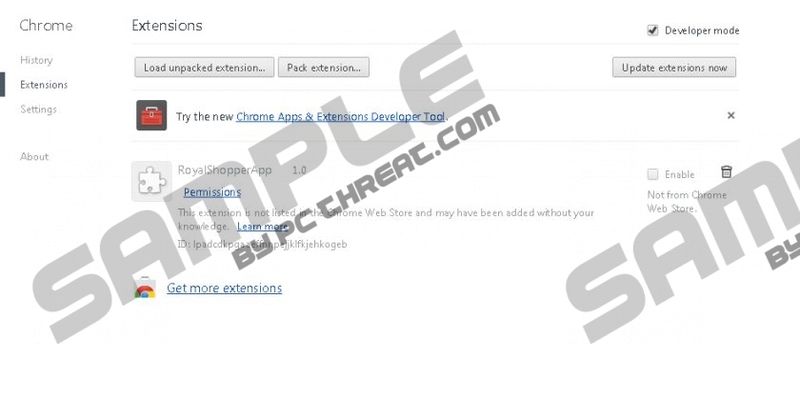 Disable and remove RoyalShopperApp from Extensions. If you have any further questions on your computer security, please feel free to contact us by leaving a comment below. Quick & tested solution for RoyalShopperApp removal.